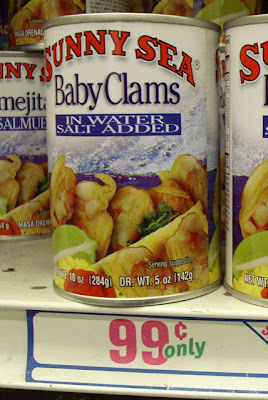 The 99 Cent Chef's first 99 cent meals involved canned & dried goods. That was the only food they sold at the 99c only Stores many years ago. 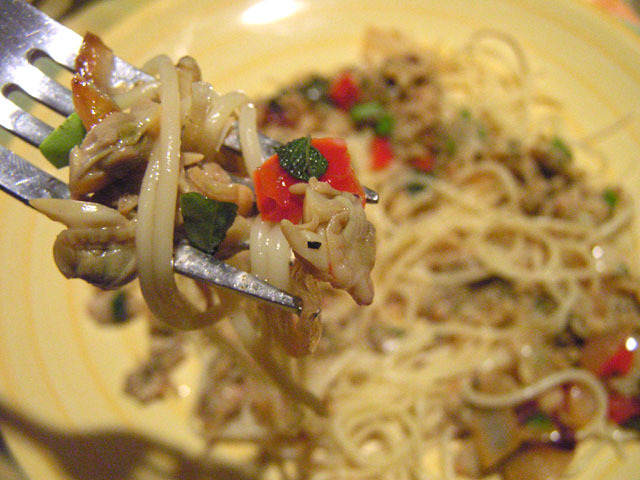 Baby clams and spaghetti became a favorite. 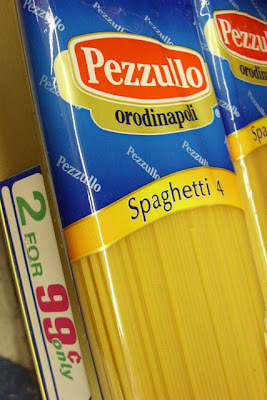 After receiving accolades for this delicious Italian pasta entree, I alway enjoyed the look of shock on my dining partner's face when I would gleefully announce, "This is a 99c only Store meal!" Try it out on someone some time. Start 3 quarts of lightly salted water to boil for the spaghetti. 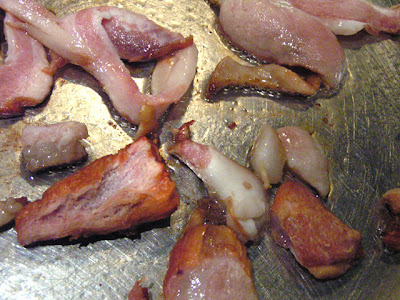 Brown bacon, then set aside to later crumble into clam sauce. 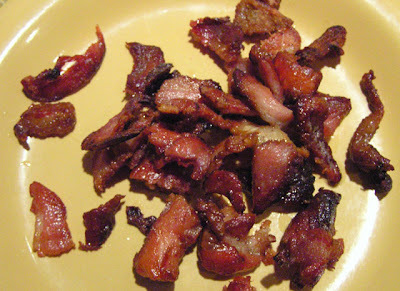 Saute 2-4 minutes chopped onion, bell pepper and lastly, garlic in bacon fat. Deglaze pan with 1/4 cup of a fine 99c only Store Sauvignon Blanc. 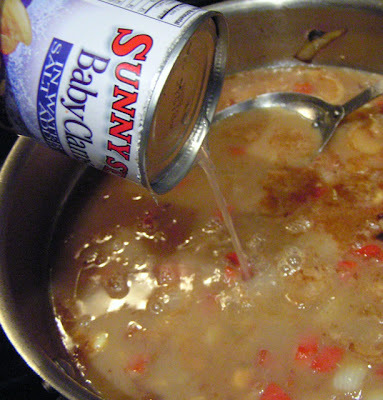 Pour in the "water" from 1 can of baby clams. Add dried herbs and reduce liquid by 1/2. Your water should be at a boil by now. 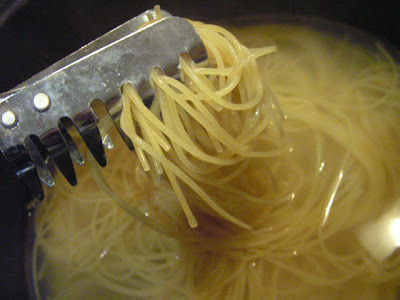 Add the spaghetti. The Chef likes his pasta "al dente," quite firm, so I cut the package cooking time in half (about 8 minutes.) Drain and set aside. 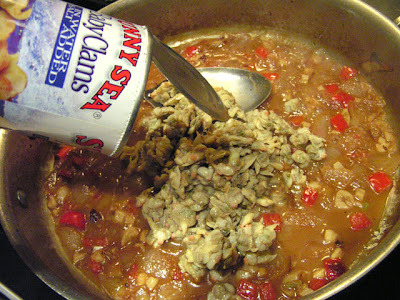 When clam "water/wine" is reduced by half, add the baby clams and butter. Cook a couple of minutes, just enough time to heat though. Add fresh herbs if you've got them. 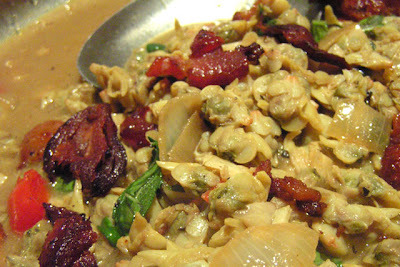 Mix crumbled bacon into clam sauce and serve over spaghetti. 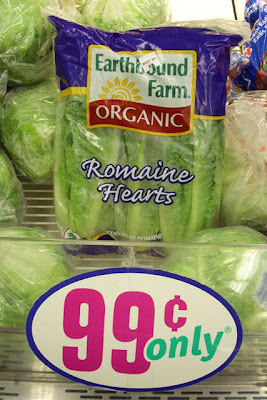 The 99 Cent Chef is not a big salad eater, however there are times when the fancy strikes. 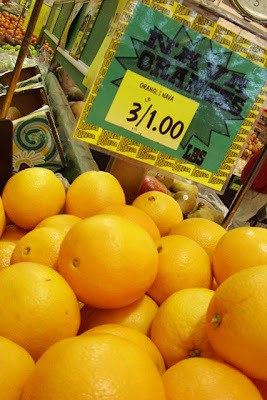 Rummaging through the refrigerator, I had no tomatoes, but plenty of oranges. Why not substitute? An orange adds enough acidity that mixes well with olive oil. It's a light, simple salad; to lead you into the next few days of heavy holiday dining. 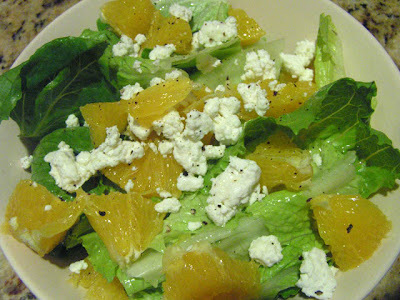 Cut out wedges of orange; add to bowl of roughly torn romaine lettuce. 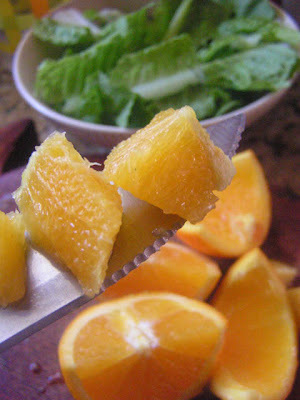 Squeeze out juice from the pulp that remains in the sliced orange, over the lettuce. Drizzle olive oil over salad. 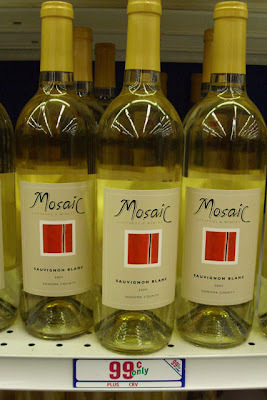 Add a small amount of crumbled goat or feta cheese. Freshly ground pepper to taste. The Iron Chef Mario Batali, at his Hollywood restaurant, Mozza. Play it here. A video in 2 parts; this is part 2 and is 3 1/2 minutes. 99 thanks to the WGA strikers at Paramount for allowing the Chef to walk the picket line. Click here to see "A Free Lunch, Part 1"
99 thanks to Pete Handelman for his quips, camerawork and for walking in Mario Batali's Crocs. Click here to see Pete's hilarious videos. To embed or view the Chef's video from youtube, click here. Comedian Dave Chappelle gives The 99 Cent Chef props. are dissed and Iron Chef Mario Batali is called out! 99 thanks to Pete Handelman for his camerawork. Click here to see Pete's hilarious videos. Let me first start out with an apology. This posting may cause a dangerous increase in your calorie intake. 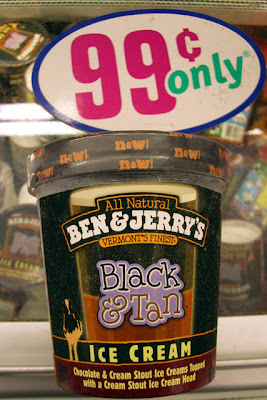 Ben & Jerry's "Black & Tan" pint servings of ice cream are at my local 99c only Store. I love the cover photo of a pint of beer. Is "Black & Tan" on sale because the public is not ready for a "Cream Stout" flavored ice cream? The 99 Cent Chef is ready! If French children, at the dinner table, can sip wine; why not America's youth indulging in Stout flavored ice cream for dessert? Hey Ben & Jerry's, do you take ice cream flavor suggestions? How about "Tequila Sunrise Sherbet," I would order that in a minute! Anyone else have a new ice cream flavor for Ben & Jerry's? Add your flavorful post to "comments." at the Paramount Pictures movie studio in Hollywood, CA. Play it here. A video in 2 parts; this is part 1 and is 2 1/2 minutes. to let rosemary/mayo mixture refrigerate an hour, or longer. 99 thanks to the WGA strikers for allowing the Chef to walk the picket line and Pete Handelman for his quips, camerawork and for walking in Mario Batali's Crocs. on the WGA strike line, by The 99 Cent Chef.